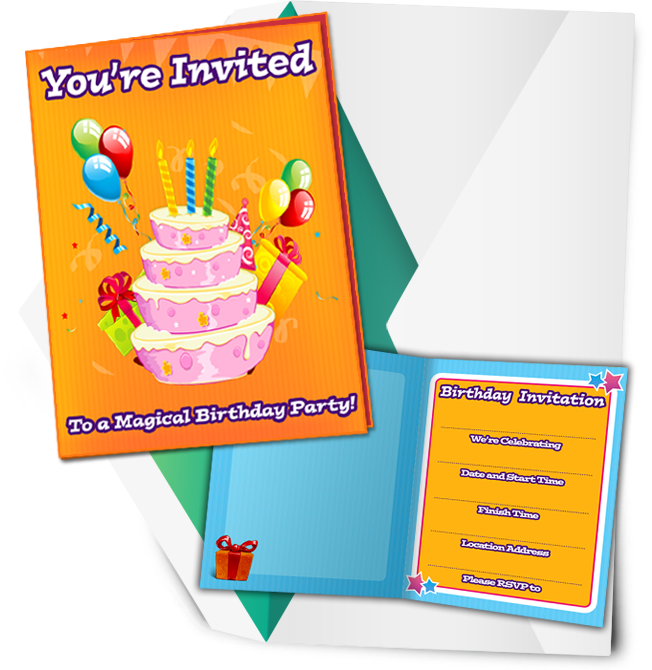 To help make your birthday party planning as Hassle Free as possible we offer free birthday party invitations that you can print out on your home computer. There are three different versions you can choose from. Printing Information: Invitations are available as a free PDF download. If the .PDF file doesn’t open, it’s because you don’t have Adobe Acrobat installed on your computer. You can download it from the Adobe website. 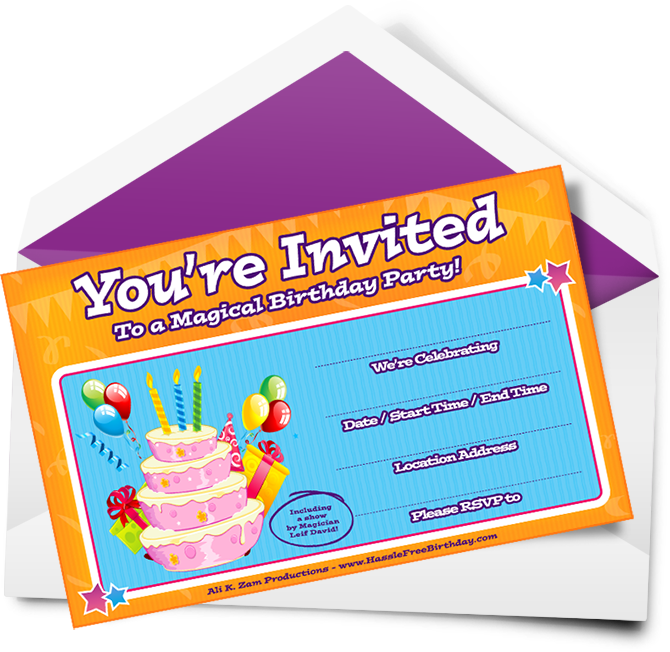 Once you open the invitation file in Adobe Acrobat you will be able to fill out your party information. That way you don’t have to write out the party information over and over again by hand. Each page will make one invitation. With scissors trim the white border. 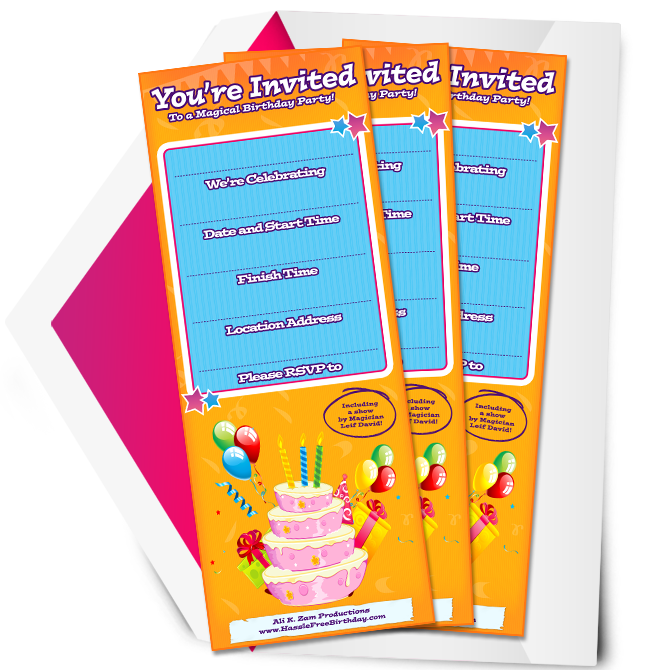 With the printed sides facing outwards, fold the party invitation half horizontally, and then vertically. This invitation also includes an extra large space on the inside for additional party details. Each page will make 2 invitations. Cut the page in half along the dotted line and trim the white page border. Leif was really great with the kids! Even the high energy kids! I would definitely recommend him! Would definitely recommend. This is our 3rd or 4th party with Leif! You are so amazing and professional! Thank you! I will highly recommend you for kids parties and adults! Thank you very much. Kids love your performance. Adults were all entertained too. Leif David did an amazing job with the kids. I have never seen the kids laugh so hard. I will definitely recommend Leif to everyone! My daughter loved it. It was amazing and she will never forget her seventh birthday! Thank you so much! I loved seeing the faces of children in wonder and amazement as you took them on a magical journey! I loved hearing the shrieks of joy and laughter while they watched you do the show….Absolutely fabulous from start to finish! One of the best birthday parties to this date! We are looking forward to another opportunity in the near future to have you attend another memorable event with your magical talent and fantastic showmanship! You left us in awe and wanting more! Thank you!